Beeswax is the major component of honeycomb. It is secreted in tiny flakes from the underside of the abdomens of worker bees, and moulded into honeycomb. Beeswax is soft to brittle, with a specific gravity of about 0.95 and a melting point of over 60°C, and consists of at least 284 different compounds, mainly a variety of long-chain alkanes, acids, esters, polyesters and hydroxy esters. These include free cerotic acid (hexacosanoic acid, CH3(CH2)14COOH), the ester of cerotic acid and triacontanol (CH3(CH2)29OH), myricin (myricyl palmitate, CH3(CH2)14COO(CH2)12CH3), and hentriacontane, CH3(CH2)29CH3. Hentriacontane comprises 8-9% of beeswax, and its stability and impermeability to water contribute to the role it plays as a structural component. Although insoluble in water, beeswax can be dissolved in solvents such as carbon tetrachloride, chloroform, or warm ether. 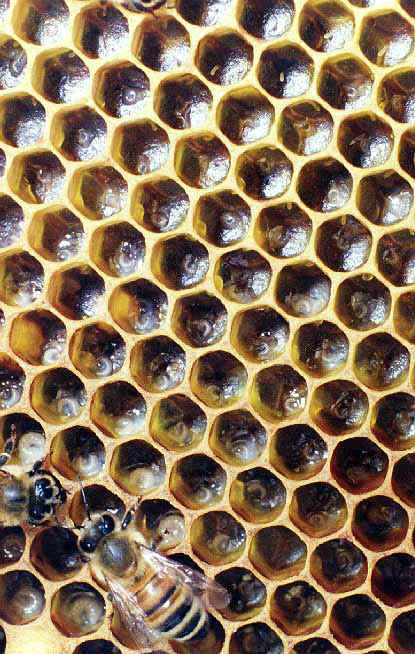 The exact composition of beeswax varies with location. Beeswax is obtained, after removal of the honey, by melting the honeycomb, straining the wax to remove impurities, and pressing the residue to extract any remaining wax. The purified wax is then poured into moulds to solidify. Colour and quality are preserved by melting the wax in water, avoiding direct heat. The wax may also be bleached. Beeswax is used for candles (religious ordinances often specify its use for church ceremonial candles), for artificial fruit and flowers, and for modelling wax. It is also an ingredient in furniture and floor waxes, leather dressings, waxed paper, lithographic inks, cosmetics, and ointments. Propolis is formed from a black and brown resinous material from the buds of trees. Bees use it for sealing cracks in the hive or for covering foreign objects in the hive that they cannot remove. Propolis is made up of phenolic compounds (58%), beeswax (24%), lipids and wax (8%), flavonoids (6%), terpenes (eg. b-eudesmol) (0.5%), bioelements (eg. manganese, zinc, and copper) (0.5%), and other substances (3%). One of these “other substances”, 3-›4-hydroxy-3,5-bis(3-methyl-2-butenyl)phenyl-2-propenoic acid, or "Artepillin C", has been found to show antiseptic activity, hair growth activity, and anti-tumour activity.